The term application is generally applied to any software that requires one or more external modules to function. Applications are not self-contained software programs, but an application of code modules to achieve a spedfic goal. It has long been debated whether there is such a thing as a true program in the Windows environment or whether all Windews programs are actually applications. Project itself is often referred to as an application, but if it is an application, it is an executable application because, aside from Windows it doesn’t require external modules to run. Global applications are far more generalized applications. These applications are designed to extend the functionally of Project 2000 itself. A properly constructed global application should be able to run (;)fl any Project document. Global applications cannot rely on specific items. 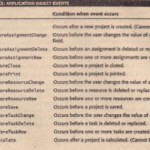 (tasks, resources, or assignments) that exist within the project file. likewise, they are far more constrained in the use of custom fields. All the customization that make up the application need to be served in the same place. If not, your project will not run correctly. After you have finished your application, use the Organizer to make sure that all the components of your project are stored together. 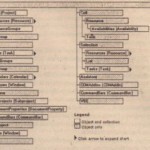 The Organizer, discussed in Chapter 21, “Customizing Project 2000,” can also be used to distribute Visual Basic components between projects . VBA is not limited to Project. You can automate any application that supports automation(also referred to as OLE automation, ActiveX automation, or OLEInprocess serving) from within Project 2000. If you have been following along with the examples, you have already used ActiveX automation. 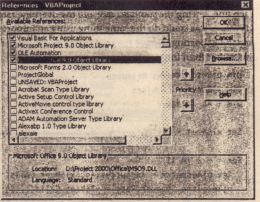 VBA procedures, including macros, control Project through ActiveX automation. There is not much difference to automating other prog~ams In VBA;you simply need to have access to the objects of the application. There are two ways to access an object, just as there are two ways to declare VBvariables. • Applications run more quickly and efficiently because part of the work is handled at compile time . 2. Scroll down the list and select the library(ies) you want to use in your application. For our application, we need to add the Excel object library. Now, you can access all the objects in the Excel object model. The VB Editor will correctly highlight code that uses incorrect methods or events.